For a few months at the end of 2016 I was between full time jobs. After lining up a new job to start in January, I found myself with a lot of free time, so I decided to check out what was going on with Diablo III’s “season” events since I had never participated in one before. I found myself contemplating what waiters in a 1920s Venetian restaurant and today’s average Diablo III fan have in common. It’s not the spaetzle or bratwurst. It’s that they both tend to remember what they have yet to finish. Sometime during the 1920s, Russian psychologist Bulma Zeigarnik was sitting in an Austrian restaurant (or maybe German; accounts differ) when she noticed something peculiar: waiters displayed an unusual ability to remember complex orders while they were being filled, allowing them to deliver the right combination of food to the right tables. But oddly, that information vanished from memory as soon as the eats were put in place (or maybe it was after the bill was paid; again, accounts differ). It didn’t seem to have much to do with sustained mental effort or chanting the incomplete orders under their breath to hold them in short-term memory. Instead, the orders that hadn’t yet been filled just seemed to nag at the waiters’ minds until they were checked off as complete. Back in her lab, Zeigarnik pursued this idea and ran some experiments1 involving the completion of various tasks or puzzles. Some of the subjects performing the tasks were interrupted, then everyone was asked to describe what tasks they had done. Like the waiters remembering what orders still needed to go to what tables, subjects were far more likely to recall the tasks they had started but hadn’t completed. This “Zeigarnik effect” subsequently entered the psychology lexicon to describe how we tend to find it easier to recall a task –and the details surrounding it– when we feel like we have begun to undertake it, but been unable to complete it. Apparently we as humans don’t like it when we begin something and don’t finish it, and such circumstances create an internal tension and preoccupation with the task. Completing the task provides closure, release of the tension, and –not to put too technical a term on it– goodie feelie type feels. 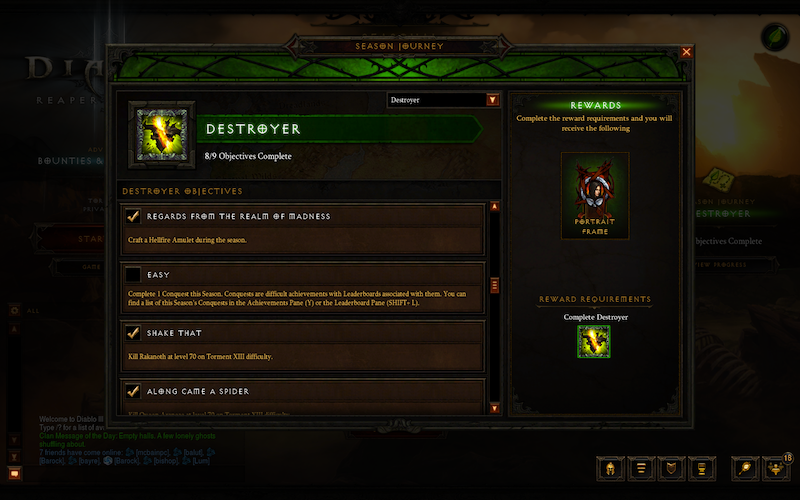 Diablo 3’s season 8 checklist. A work in progress. And we see this all the time in games, particularly role-playing games where in-game journals get crammed full of unfinished quests, errands, and tasks. Ever wring your hands over a huge list of incomplete quests or feel hesitant to progress the main quest until all those little side missions are checked off? To see the effect in action the next time you play a RPG try at the end of your gaming session to recall as many open quests as you can relative to completed quests. MMOs are designed so that your list of tasks is never done. No sooner do you complete one, then two more pop up to take its place. Like a digital game of whack-a-mole, accomplishment only brings more unfinished business. As soon as you finish or “turn in” a quest, you are immediately offered another one with an even bigger reward. Or perhaps completion of one “unlocks” the opportunity to receive many new quests at once. Quests are often linked together in a series that helps move a story along, but never provides much closure. If I need to find 12 jewels to complete my quest, I will not stop at 11. This became concrete for me last December when I tried to complete Diablo III’s Season 8. The game’s seasons let you start with a fresh, level 1 character and give you a sprawling checklist of tasks to complete, like “Finish a level 70 Nephalem Rift on Torment V difficulty” or “Buy a legendary item from Kadala” or “Level 3 legendary gems to level 45.” It seemed to me that the entire point of playing the season was to complete the checklists, and the ones that stumped me were constantly on my mind. We also see this happen in empire building game series like Sim City or Civilization. The “just one more turn” is a direct result of the Zeigarnik effect, since that one more turn is almost always in the service of completing some structure, upgrade, technology, or conquest. But regardless of whether the effect shows up every time a task is interrupted, it does often happen. The next time you find yourself thinking “just two more turns until this research is complete” or “I just need to kill the trolls to make this quest log entry go away” remember Bulga Zeigarnik and her waiters filling orders for hot dogs and waffles. Or something. I hear they were out of schnitzel. 1. Zeigarnik, B. (1927). Uber das Behalten yon erledigten und underledigten Handlungen. Psychologische Forschung, 9, 1-85. 2. Rigby, S. and Ryan, R. (2011). Glued to Games: How Video Games Draw Us In and Hold Us Spellbound. Santa Barbara, California: Praeger. 3. Schiffman, N., Greist-Bousquet, S. (1992). The effect of task interruption and closure on perceived duration. Bulletin of the Psychometiric Society, 30 (1), 9-11. 4. Reeve, J., Cole, S., and Olson, B. (1986). The Zeigarnik Effect and Intrinsic Motivation: Are They The Same? Motivation and Emototion, 10(3), 233-245. Very insightful. So the addicting factor (or one of them) has a name already, thank you for illuminating it. I do wonder how much of it is intended (e.g. Season Journey in D3, Quest lines in WoW) and how much is just an integral part of how the game has to be constructed (e.g. Sim City, Don’t Starve, etc.). I just found the blog. Dig this post, and I have observed this phenomena in myself. The other side of the coin is that if you put too many tasks onto the player all at once they will most likely feel overwhelmed and might just give up on doing them. It’s a balancing act.